Locality: Skaergaard Intrusion, Greenland. Link to MinDat.org Location Data. Name Origin: Named for Troels F.D. Nielsen (b. 1950), a geologist with the Geological Survey of Denmark and Greenland. 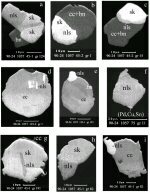 Comments: BSE images of nielsenite (nls), skaergaardite (sk), chalcocite + bornite (cc + bn), bornite (bn) and chalcocite (cc) in non-magnetic ore concentrates.. Location: Skaergaard Intrusion, Greenland.. Scale: See Images. RL Color: Bright creamy white with no internal reflections. note: Specific Gravity of Nielsenite =5.56 gm/cc. U=PENielsenite x rElectron Density= 513.16 barns/cc.